Friend and business associate, MJ, demonstrating a yoga pose I can only hope to do. I believe the key to success with any plan is to remain flexible. A week ago my marathon training plan was interrupted for a few days. Not by injury rather more due to life in general. After my Monday night run on June 9th my legs were dead. No wonder as I had completed 56 miles and 10 runs during the previous 8 days! My old body was not use to that. So rather than get out to run the next morning, I took a day off. The following day weather and our running group’s after glow party took priority. Then Mother Nature was not in a good mood again. So I lost a total of 4 days and only completed 25 of the intended 40+ mile week. This is where the flexibility comes into play. Rather than sit idle, I viewed these days as opportunities to do another form of training, yoga. 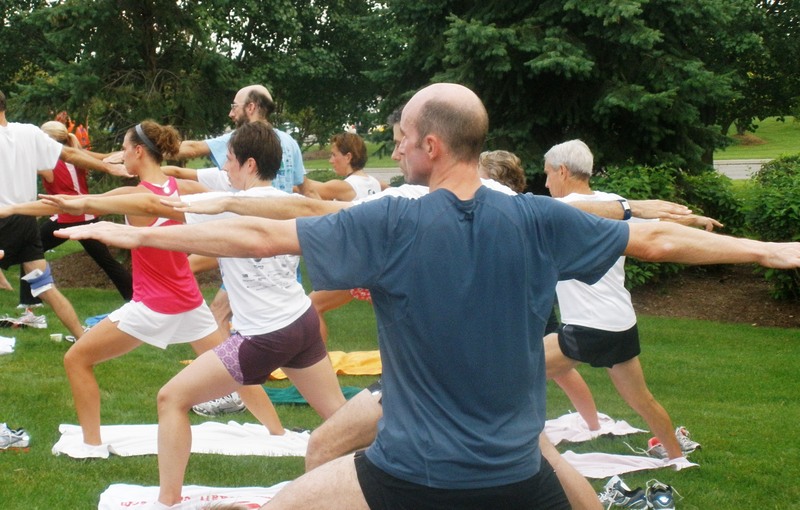 I have been practicing yoga on and off for the past several years since MJ first introduced yoga to our training group more than 5 years ago. Like running, yoga can be done everyday, but like a new runner, new yogis (especially runner yogis) seldom do these important routines nearly enough. Back to that first Tuesday of rest, I started that morning with mediation and relaxing stretches. Before I knew it my time was up and I needed to return to reality. Over the next several mornings I did other stretches, generally attempting to loosen up my hips and stretch the upper body. This past week I have returned to a more normal, on-schedule running routine. Unfortunately a few less stretches, but I do feel a difference in my stride and upper body during my runs. So I need to continue to find time for my yoga, not let it slip out of practice and remain flexible. 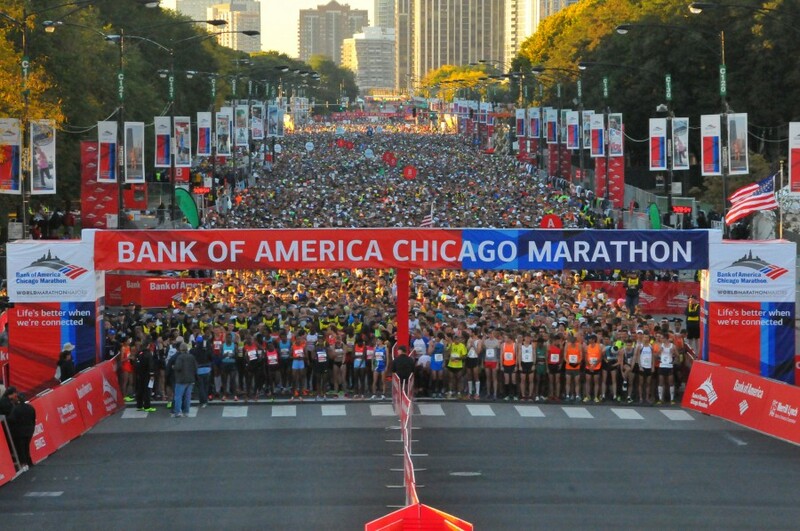 The start of the 2013 Chicago Marathon, I hope to be somewhere in the middle of this crowd on Oct.12 this year. Actually I have been the stranger for not posting here in the past five weeks. I do have a good excuse however. I have simply been out there running more! This past April I won the lottery, no not that lottery, the lottery to be among over 40,000 other runners to compete in this year’s Chicago Marathon on October 12. After winning my age group at The City of Oaks Marathon in November 2011, I thought I had retired from marathons. But this year I decided to try to enter Chicago because of the unique opportunity to run it with my daughter Alexis. We each entered the lottery and we each won! This will be her first marathon. So I thought I might stray a bit from the usual theme of mixing running and architecture and begin to post my efforts to train for Chicago. I hope to post at least once a week and will try my best to keep these posts short and sweet. To bring you up to date what follows is a very short summation of the training since April. Actually, I have been running pretty consistently all year (as I have been doing now for more than several decades) so the training started with a solid base of miles. April was all about the mindset. Sure one needs to log plenty of miles to successfully complete a marathon, but if your head is not in it, your marathon experience will not be a very enjoyable one at all! At first I found it difficult to jump right from the regular routine of running 25-30 miles per week to a more rigid schedule with many more miles each week. The real change occurred in May. My work schedule M-F is normally 7am to 4pm. This makes it difficult to get any kind of a run in the mornings. I was able to change my schedule to a later start thus allowing me an extra hour to run or do another type of workout such as yoga. I still get out of bed at the same time as before, but now I am out there running. In late May I started to run nearly every morning. These runs typically are not long or fast, but when combined with evening runs scheduled on Mondays and Wednesdays they will provide a significant opportunity to build my mileage base to where it needs to be. At this point I am now running 40-45 miles per week. The month of June simply is the best month of the year to train in Michigan. The weather is nearly perfect for running, especially early in the mornings. It is actually light enough at 5:30 in the morning to see your watch without any backlight! There is also a new freshness when combined with the long range outlook for racing in the fall makes this time of year my personal favorite. Like every team is a champion in their pre-season training camp, every runner is headed for a PR (personal record) in their upcoming fall marathon. In addition to building the mileage base, I simultaneously need to lose some weight. For me this will be more challenging than building the miles. It always has been. Ironically, training for a marathon tends to add weight to people versus any significant loss. I have been paying close attention to my diet needs and doing well. I am on a path towards my goal but from here on out, it will be difficult. For now, all is on track; I simply need to run more, eat right, and enjoy the experiences along the way. Thanks for taking the time to read this, check back again soon, and Run Happy!